DULM | What Does DULM Mean? 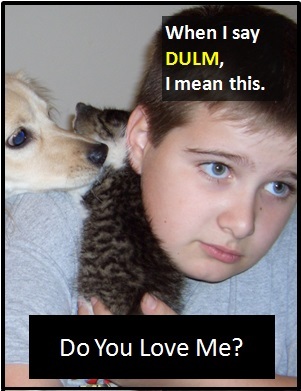 DULM means "Do You Love Me?" The abbreviation DULM is a shorthand way of asking "Do you love me?" DULM is usually used by women in times of insecurity or by men as a way to manipulate. In all situations the expected answer is "Yes". Definition: Do You Love Me? James: Why have you been so sulky lately? Lisa: I just don't know how you feel. DULM or have you gone off me? Jason: Wow, your friend is gorgeous. Kay: Is she prettier than me? DULM. Do you want to break up?. As it is pronounced using its individual letters (i.e., "Dee Yuu Ell Emm"), DULM is classified as an initialism abbreviation. Initialisms are different to acronyms, which are spoken like words. DULM plays the role of an interrogative sentence (i.e., a question), but it is commonly seen without a question mark. In other words, it can be written "DULM?" or "DULM".